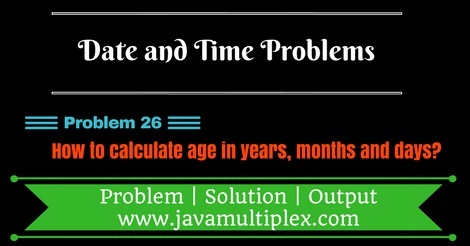 Home Date Interview Questions Difficult Date Questions How to calculate age in year, month and days in Java? Write a program in Java that calculates an age of the person. For doing this calculation we are using Java 8 API methods that are very simple and straightforward. Convert both the dates to LocalDates. Pass both LocalDates to between() method of Period class that is present in java.time. * package. Use getYears(), getMonths() and getDays() methods of Period class to print years, month and days respectively. How to convert Date to LocalDate? Note : Java 8 is required to run below code because we are using Java 8 API methods. * @problem How to calculate age? // Get default Time zone Id. System.out.println("Age : " + period.getYears() + " Years " + period.getMonths() + " Months "
Output - How to calculate an age in years, months and days in Java? Note : You can also validate your result using age calculator. Write a program in Java that calculates work anniversary. Write a program in Java that calculates marriage anniversary. Solution of both the problems is same as above. Tags : Date and Time problems, Age in years, months and days in Java, Solution in Java, ZoneId, Instant, LocalDate, Period, if else statement, DateFormat, SimpleDateFormat, String, Regular expressions.